HGA Creative has bought the Northwest Football Awards (NWFA) and Northern Sports Awards off online publisher How Do. The agency, which has managed the awards since their inception in 2007, organised this year's 5th Annual Northwest Football Awards. The awards took place on Monday 14 November and celebrated the North West region’s football scene, recognising and awarding both on- and off-pitch talent. The NWFA is supported by organisations including Fifa, The Professional Footballers’ Association (PFA) and The Football Foundation. 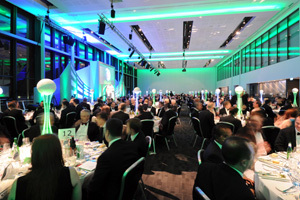 Nearly 450 guests attended the event, which included a speech from PFA chief executive Gordon Taylor, who was presented with the Lifetime Achievement award, while Goal of the Year was awarded to Wayne Rooney. Ian Grime, HGA’s director of live events, said: "We are delighted with our acquisition of the North West Football Awards and the Northern Sports Awards. "It has been a strategic objective of ours to strengthen and expand our presence within the live events industry through ownership; it’s great to be doing so starting with these events. When the opportunity was presented by How Do, we were immediately interested and excited at the prospect of developing them from their strong foundations." How Do launched the NWFA in 2007. Nick Jaspan, How Do’s managing director, added: "As these awards have become bigger each year and with the scope to develop the initiative beyond our native North West, we decided together with HGA, the company which has delivered all the event management to date, that the awards could move onto the next level under HGA management. "HGA already manages a number of sports-related events including projects for football clubs including Bolton Wanderers and organisations including the National Football Museum and the Football League Trust. We wish HGA and the NWFA all the best in the future."